One of the options under consideration is extending the Borders Railway south of Tweedbank. Time is running out to have your say on a Transport Scotland-commissioned study set to help shape future spending on the region’s road and rail links. A six-week consultation period on the Borders transport corridors study draft report published by Jacobs UK last month ends tomorrow, June 1. 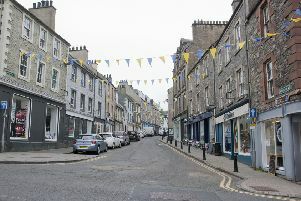 Borderers are being encouraged to have their say on 21 options recommended for further appraisal. Those options include extending the Borders Railway south-west to Carlisle or east to Berwick. They also include turning stretches of the A68 Edinburgh-Darlington road and the A7 from the capital to Carlisle into dual carriageways. The report and responses to the consultation on it will be considered as part of a national strategic transport projects review. The Scottish Government is already committed to weighing up the case for an extension to the 30-mile Borders Railway beyond Tweedbank and improvements to the A7 and A68 but wants to gather more information before proceeding any further. Selkirkshire councillor Gordon Edgar, Scottish Borders Council’s executive member for roads and infrastructure, said: “This is a hugely important report, with a number of interesting proposals on cross-border connections, an active travel network and town bypasses. Mid Berwickshire councillor Mark Rowley, the authority’s executive member for business and economic development, said: “There were a huge number of responses to the initial consultation for this study last summer, and it would be fantastic if it could again see significant feedback for this survey on the draft report. “With the 21 options including the potential extension of the Borders Railway to Hawick and beyond, it really is a vital document for the future of our area.